16 Pretty Anarkalis & Suits To See You Through Shaadi Season! 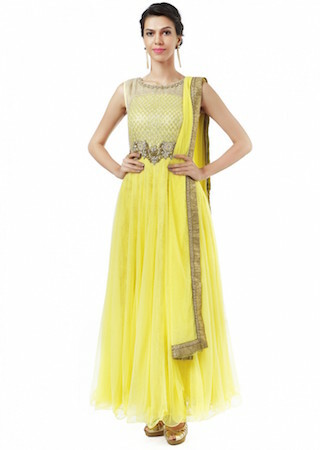 The shaadi season is fast approaching, and you haven’t yet sorted your outfits, have you? Don’t worry, we’ve got your back. Not just shaadis, we’ve put together some great outfit options for the festival season too, that’s just around the corner. Here are 16 suit sets to make sure that you look as trendy and gorgeous as always! This cleverly draped dupatta with tiny bootis on it looks elegant, and the dainty flowers on the waist add grace to the subtle coloured anarkali. Match this with tiny danglers and slinky heels. Price: Rs 3,150. Buy it here. When you have loads of pinks and reds, you’ve got to get some blues as well, to break the colour palette. 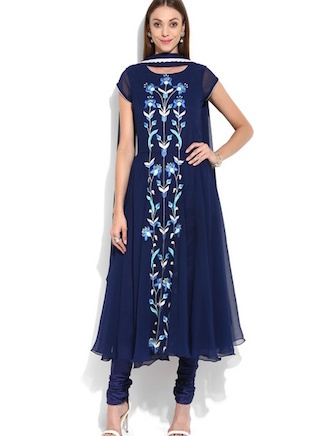 This midnight blue, flowy suit, along with the lovely floral embroidery running through the front of it, is SO suave. Price: Rs 3,150. Buy it here. If you are the girl who likes a little bit of shine in her outfits, you’ll pick this one. That brilliant blue with gold zari motifs running through it, along with that bold red - perfect, isn’t it? Price: Rs 5,999. Buy it here. This black and gold combination is what the paparazzi wants to snap. The gold layer starting on the waist, along with the sweet neckline details, makes this one special! Price: Rs 3,150. Buy it here. 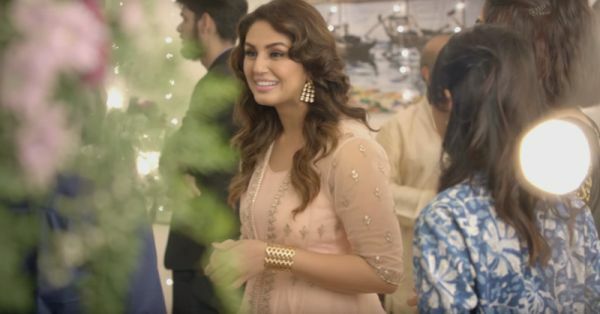 This adorable anarkali is making us happy. The peach and bright yellow are just getting along so well. We love the chevron pattern, which is a good change from linear borders. Wear this with subtle jewellery. Price: Rs 2,940. Buy it here. The carefully planted tree motif on the yoke and the countless numbers of gathers make this one festive enough for us. 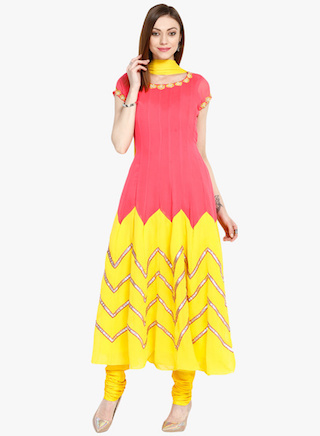 We love the shade of yellow, and the rani pink goes well with gold. Price: Rs 4,299. Buy it here. This two-in-one outfit is grand. The basic pink anarkali, along with the coral pink jacket, and silver embroidery, make this ensemble perfect for a dressy occasion. Wear a long pendant if you want to add some more charm! Price: Rs 3,150. Buy it here. We are in love with this colour. The lovely anarkali definitely deserves a place in your closet, for it’s not often that you find a beautiful suit in this hue. Wear this with gold danglers and bangles. Price: Rs 3,295. Buy it here. When you are a modern woman, it’s likely that you like things that are a bit more neat and sharp. This black and pink suit is all that you need when you are planning on making that statement. Price: Rs 1,150. Buy it here. Traditional splendour, this teal and pink suit is simply breathtaking. The intricate details all over, from the floral embroidery to the polka dots and border…it’s a piece that has a lot of attractive elements! Price: Rs. 1,199. Buy it here. 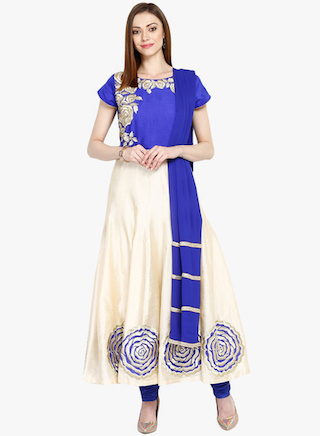 Simple yet graceful, this long solid coloured anarkali is for the woman who likes her clothes to be uncluttered. 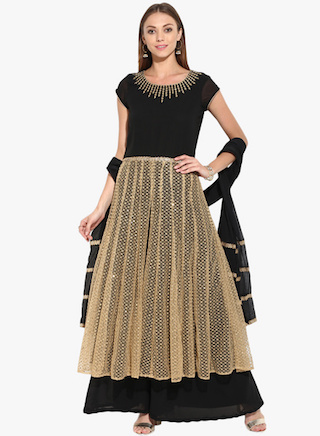 The gold work around the neckline adds some magnetism that completes the outfit beautifully. Price: Rs 5,340. Buy it here. With capes being the rage, how can you not try one too? 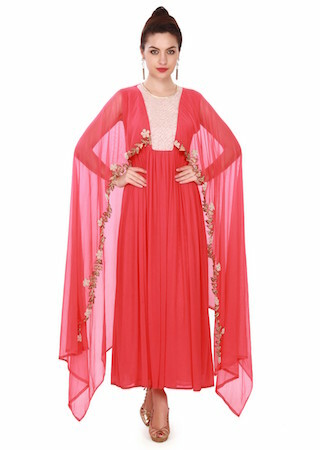 This bright coral outfit with the cape dupatta is enticing. The tiny florets around the hem makes it prettier still. The perfect contemporary look, we say. Price: Rs 5,340. Buy it here. This stunning outfit has an interesting style. The drapes go across the lower part of the kurta and the ornate gold work all around works its magic on the person wearing it! Definitely a must-have. Price: Rs 5,940. Buy it here. 14. The Bold Blue And Ivory! When you want to exude confidence, you have to choose your outfits wisely too. This colour blocked blue and ivory suit is a dream come true. It’s unique, and so ravishing! Price: Rs 2,940. Buy it here. 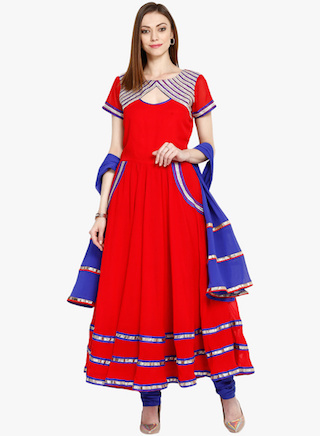 We can never have enough reds in our ethnic wardrobe. What we love most about this one is the neckline. The stripes running all over, and the colours…it’s making us drool! Price: Rs 2,100. Buy it here. This magnificent suit is the ultimate showstopper. The lemon shade along with sprinkles of gold all over is a winner. Add the finishing touch with some long statement earrings! Price: Rs 5,340. Buy it here. A place where girls can talk about ANYTHING. (No guys allowed!) ? ? Get the POPxo app NOW on Play Store and iOS App Store.